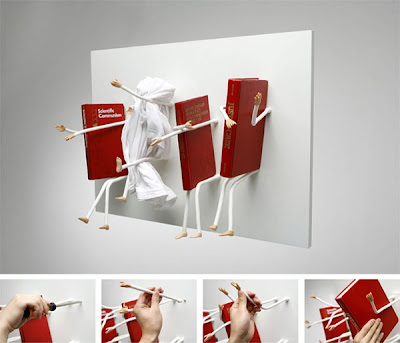 While the long bookshelf moves from side to side, the handle part doesn’t. 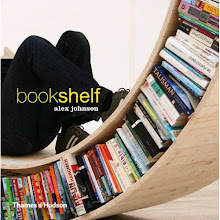 Choose a small bookshelf and pull the bar down, and it comes down on the desk. 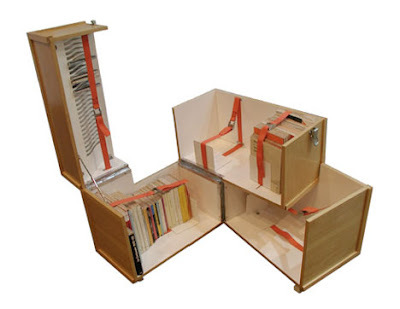 So here you can be lazy again, take and put back the books while you’re sitting at the desk. 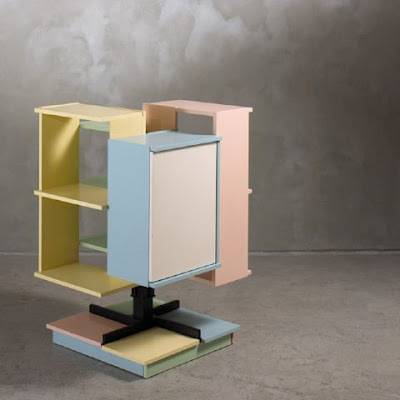 The 3 Square Bookshelf is part of the Slippery Shelves series by Mark Righter and offers a new take on floating shelves: the shelves slide through a back panel into infinite configurations. 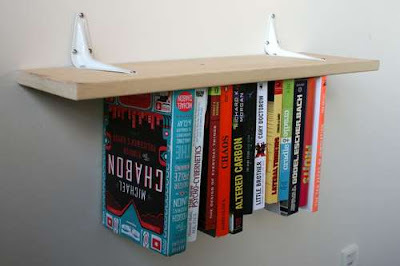 The back panel mounts easily to the wall and the shelves slide right in. Includes mounting board, screws and anchors for easy installation. Beeswax and cloth for future maintenance. 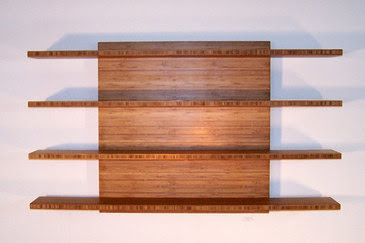 The bamboo shelves are offered in natural and amber tones. 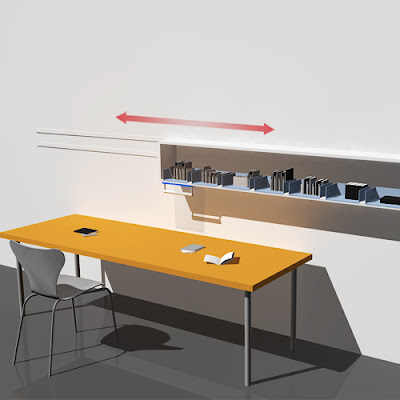 - Intershelf spacing at 11"
The shelf has always been essential to every interior. 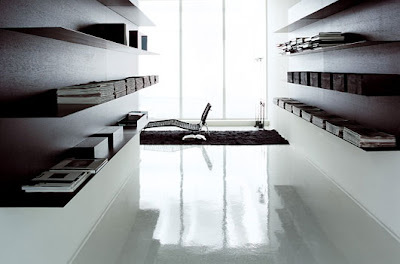 As time has marched on, the styles of shelfs and storage-systems may have been transformed, but their nature still remains the same. This furniture generates an object with a new spirit, which merges with our modern requirements, it allows a flexible use of space. 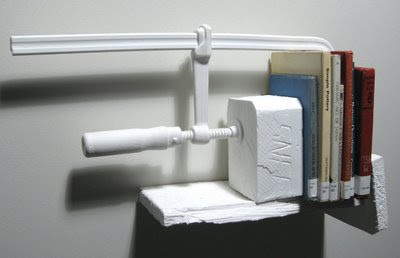 A shelf let transform a sculpture, just out of two different parts. Bargain bins outside Pages Bookstore, on St-Jacques, across from Lionel Groulx metro. The cozy neighbourhood second-hand bookstore also features comfy - if scruffy - armchairs, wireless Internet, a coffee bar, a back-alley terrace of sorts, and performances by local musicians in the evenings. Yes, these are just planks of painted plywood nailed to the supports for the loft above. 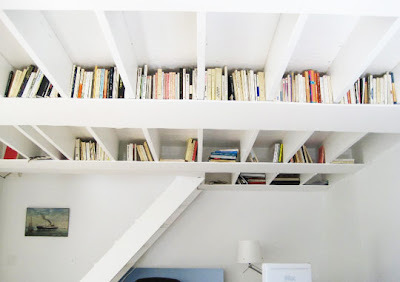 They create perfect cubby spaces to store books, baskets and even small lights. Since we're in California, it would probably be a good idea to secure everything in place so it doesn't shake right off. An original and stylish way to store your books and knick knacks - in elegant espresso brown. 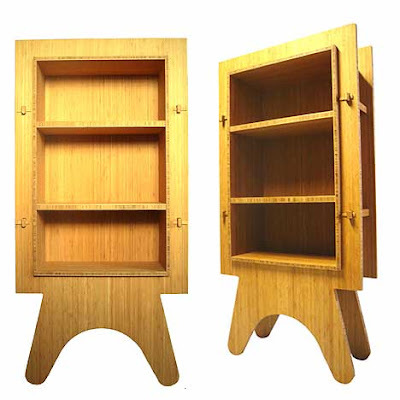 Crafted from rubberwood. 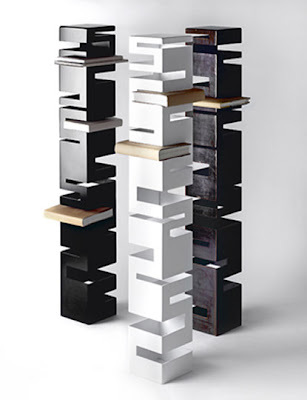 Bookcase based on self – supporting panels in natural Metacrilate (PMMA), linked togheter by special die – cast joints. Turned aluminium support feet with level adjuster knob. designer: Aisslinger. In Bonn, Germany, I noticed a bookcase full of books in the public park where I run, with a young woman removing one book and returning another. 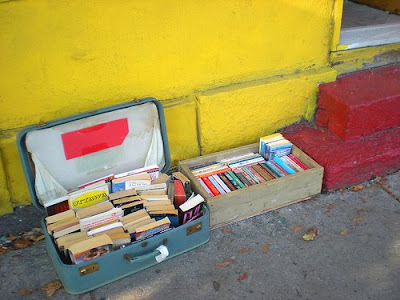 These are used books that make up essentially a free voluntary lending library. A rusty and bent nail doesn’t have any reason for being. But the nails begin to inform me about their valuable being widely as soon as the book is laid on the useless nails. When they’ve met their trunk called the book, they were able to get a significant life force as arms and legs of our body after all. 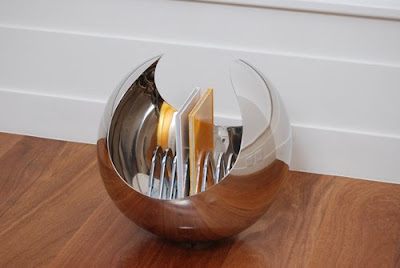 Fix or swivel bookcase with round base. Frame: matt painted wood. 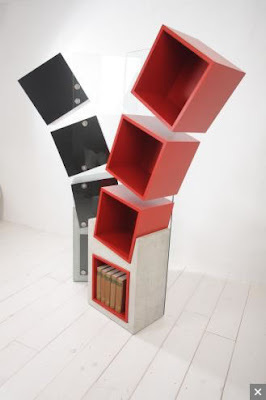 Modulable hanging bookcase with die – cast joint system to fix shelves to uprights available in mongoi. 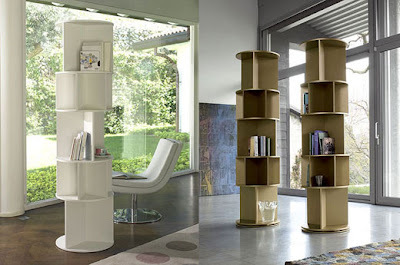 Upright, on which shelves are sliding, are improved with a technology that hide shelves connection. 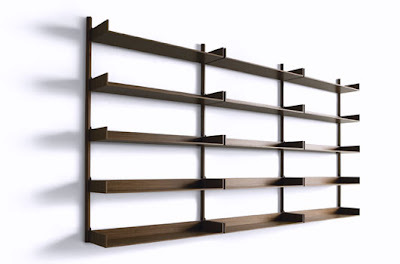 Shelves show “great span” and are available in two dimension: 90 cm and 120 cm. 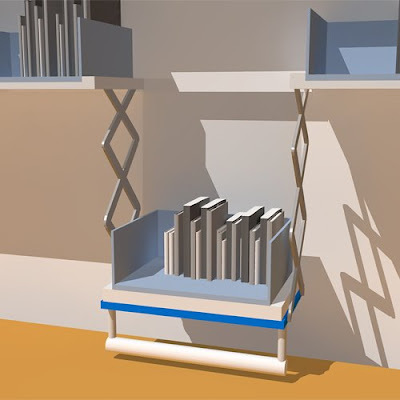 Shelves can be placed every 8,2 cm. 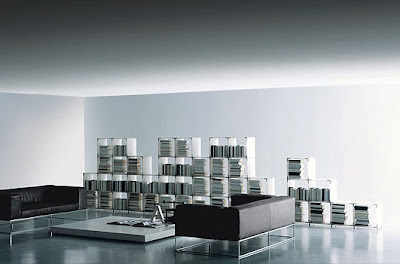 Designer: Piero Lissoni. 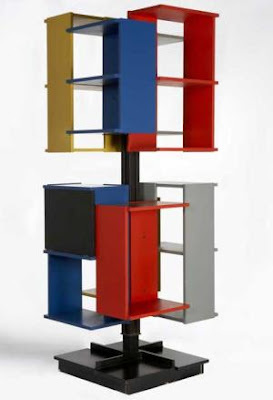 Bookcase built with special, highly resistant, wax-finished steel, aluminium or white painted shelves. The wall-mounted panels are available in steel, oak, “carbone” oak, mongoi, mirror, in all matt or glossy colours of our collection. A spectacular bookcase is hand-carved with angels or cherubs, devils, monks, griffins and a lion head. 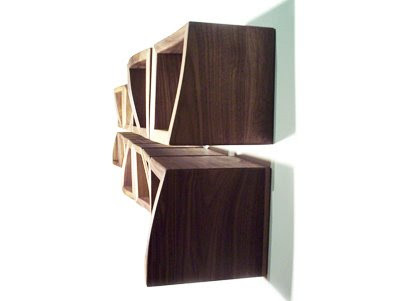 The artistry in solid walnut is in high relief, masterfully carved with bold and energetic strokes and vivid imagery. There is slight wear to the original finish from about 1890, and the warm patina is wonderful. This antique furniture is actually 3 separate stacking pieces for easy handling. Old and wavy glass in the doors appears original, inside, carved shelves are adjustable on wooden supports. Traditional European Renaissance style craftsmanship is evident all over this heroic bookcase or display cabinet. Measurements are 44" wide, 26" deep and 8' 10" tall. Cubes (37x37x32) of wood or MDF / ferro-concrete base / safety glass back wall. Hex is a unique and ingenious concept combining contemporary furniture design with quality,hand-printed wallpapers. 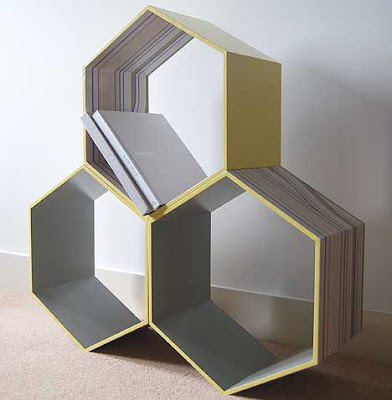 Hex is a versatile storage unit that can evolve with the user, allowing you to add, create or re-create the way in which you use and view the poduct. Hex is a highly desirable and useable piece of furniture that is sure to add a striking and bold statement to any living space.